We are a premier provider of marine & offshore solutions focused on delivering industrial best commercial and technical ship management services that meets the requirements of our clients who operate in the competitive shipping and offshore industries. Marine & Offshore Solution (MarOff) is led and managed by a team of highly capable individuals with vast experience in the commercial and technical aspects of shipboard and fleet management. Our key team members consist of Chief Engineers and Master Mariners, who not only have extensive knowledge in the technical and operational management of a wide range of vessels and offshore crafts..
Handing over the management of the multi-purpose bulk carrier to Owner for self management after training the client’s personnel and developing client management system. Presently acting as the Management Consultant on Retainer basis. Appointed as Ship Manager for two units of 7,000 DWT IMO II Chemical Tankers being build and China by an upstart local Ship Owner. Also appointed as the New Building supervisor overseeing the local supervising team whilst the vessels are being built pending delivery. Project management for the retro fitting of the double hull tankers (3,500 DWT and 6,500 DWT) for compliance to Oil Majors requirements and installation of Hose Cranes for bunkering. Appointed as Ship Managers for a 6,500 MT DWT double hull oil tankes. Coordinated the delivery of the vessel to Owners, change of full crew set, flag and name of vessel in China. Marine & Offshore Solution Sdn Bhd relocated it’s business to it’s new and larger premises at Jalan Kuchai Maju 9, Kuala Lumpur. The Company was entered on the membership register of Malaysian Shipowners’ Association (MASA) as an associate member. Document of Compliance issued under the SOLAS Convention 1974, as amended, by Class Lloyd’s Register on behalf of the Government of the Kingdom of Thailand. And also a VLCC of 285, 356 DWT to replace an older vessel. Both these vessels were converted into a Floating Storage Unit. To meet Marine Department’s requirement to ensure vessel will not drift from her designated position, both were moored permanently to Single Buoy Moorings at Port of Tanjung Pelepas. Appointed as Ship Manager for a 450 TEU feeder container vessel servicing the Port Klang – Singapore – Kuching route operated by a well established Malaysian container liner service provider. 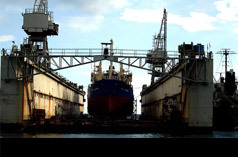 Appointed by ship owner as project consultant for a 450 TEU container vessel’s mandatory dry-docking and upgrading repairs at CSSC Guangzhou Huangpu Shipbuilding Co.Ltd. MarOff Office re-located to a larger and established area at Kuchai Business Park around Sept 2011. Appointed as Technical Manager and ISM/ISPS Manager in May 2012 for a 561 TEU feeder container vessel servicing the Port Klang – Singapore – Kuching route operated by a well established Malaysian container liner service provider. Appointed as Technical Manager and ISM/ISPS Manager in Aug 2012 for a 1,016 TEU feeder container vessel servicing the Port Klang – Singapore – Labuan – Kota Kinabalu – Tawau – Sandakan route operated by a well established Malaysian container liner service provider. Delivery of said vessel was done in Singapore with change of name and change of flag carried-out successfully within stipulated time frame by Owner. Appointed as Technical Manager and ISM/ISPS Manager in Dec 2012 for a 1,504 DWT oil/chemical tanker servicing the Tanjung Langsat – Balikpapan – Samarinda – Pendingin route operated by a well established Singaporean charterer and Malaysian owner. The vessel is chartered to oil majors. Delivery of said vessel was done in Greece with change of ownership and change of flag carried-out successfully within stipulated time frame by Owner. Appointed Ship Manager for 2 Panamax bulk Carriers for ship management. Registration into Malaysian Class & all manual compilation completed. All requirement for Class & Flag state including DOC attained. Delivery aborted by Owners due contract negotiation & licensing between charterers. © Copyright 2010 of Marine & OffShore Solution Sdn. Bhd. All rights reserved.